It's a new week, so let's get it kicked off with a new genre. Well, to be accurate, a new genre for me to be reading and reviewing on my blog. I have never liked the mystery/thriller/suspense/adventure genre and have often made note of that when I read books that walk the line with other genres I do read from regularly. I feel that too often the authors from the world of intrigue never seem to develop foreshadowing correctly. They play their hands much too early, and I am left reading a book for which I know the ending. Publication Date. The book was published in 1973. It is a whole other world. I almost felt like I was reading a fantasy book in a way. The dialogue used is from another era; the jargon is a little before my time and places have changed names, though most of the technology is an overlap so I never felt completely adrift. There were often references I had to search because they have become dated. Publication Date, part 2. I am also completely in love with the lack of a PC filter. These books say what comes to mind about the people and places around them without worrying about hurting someones' feelings. I miss that in literature. Why do we always have to make every single demographic happy? It's unrealistic. Burn out. I seriously had a fantasy/literary burn out; to the level a young adult/middle grade book wasn't going to palate cleanse. I really needed to get a book way outside my reading pay grade. This one did that with flying colors. I loved it. Actually, I read the book in one day. They do not appear to be long term reads (as I am now half way through Iceberg in just half a day). This adventure was the exact break I needed from the epic journey of fantasy. Even light, fast young adult reads can really get you bogged down in the emotions. 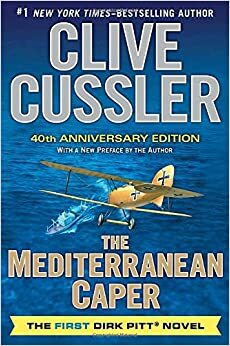 Dirk Pitt keeps you interested but not overly invested. I now understand a little more clearly why people get addicted to this genre. I was also pleased that I never really knew exactly what was going to happen. I had several hunches that ended up being spot on but could still be surprised by some of the information. The story was a great escape and has me renewed for the amazing line of fantasy coming out this summer.